← France did it: Sold the Mistral Helicopter Assault Carrier to Russia! Melt the margarine or butter. Pour into a mixing bowl with the eggs and sugar until creamy smooth. Then add the milk and mix another 30 seconds. Add 1 1/2 cups flour and the cinnamon into another mixing bowl and make sure mixed into a blended product. Then gradually stir in the liquid from the first mixing bowl until you make a bread like dough. Roll the dough out to around quarter inch thick. Cut out rings of dough using two concentric cutting circles. Two different cookie cutters are great as long as there is about a half inch difference in circumference. Heat a skillet with the vegetable oil on medium – not too hot. Drop the dough rings into the oil when oil is hot and cook until lightly golden. Flipping doughnuts over as one side browns and get the other side. 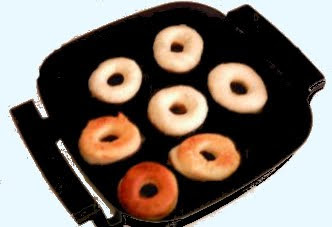 Remove the cooked doughnuts from the skillet and set aside onto a plate covered with paper towels. Eat them while still warm, sprinkled with powdered sugar, or cinnamon sugar and dip in your favorite icing.